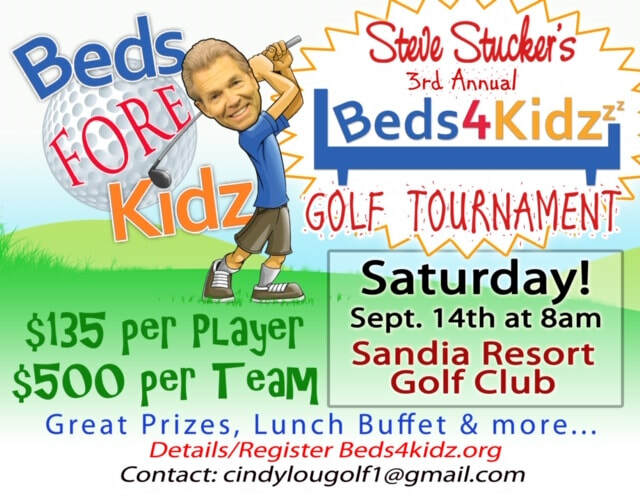 Annual Golf Tournament - Beds4Kidz - helping kids and their families in Albuquerque, NM with free, gently used beds. ​Anybody that knows our founder Steve Stucker knows he really knows how to put the FUN in FUNdraising! We count on generous donations all year long from individuals and businesses for new and gently used beds and linens to give away to those in need. We also have some MAJOR FUNdraising events each year that are crucial to keep the ministry going, including our Annual Golf Tournament! ​REGISTER ONLINE NOW! Sponsorships are available. Please contact our tournament Cindy Hummel @ cindylougolf1@gmail.com.